There are a couple of choices to do this. You could either buy one ready made from a Company such as Rhencullen. But if you are tight like me, you could always try and make one. Heres how. Taking the under tray out is reaonable easy. Take of the seat, tail units, battery and tail light. Everything else can be undolted from the tray - you don't need to unplug the relays / CDi box or anything. Now to get the tray out. 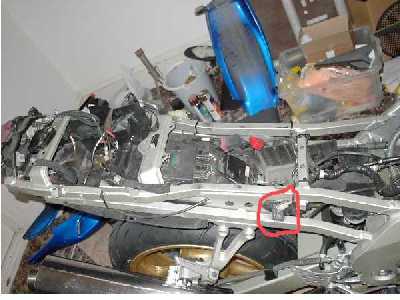 It is a bit tricky, but there are two lugs that need to be pushed in to clear the seat subframe. They are a but stiff, and you need to work one at time. Next we need to get some fibre glass and make a new bottom. I decided to tape up the bottom to and fbreglass from the inside .......damn wher are those pics???? I need to finish this!!!! !